The SNC-Lavalin scandal was never about saving jobs until the morning after Jody Wilson-Raybould gave her testimony on February 27th. While the Bloc Quebecois were harping on the alleged number of jobs that were at risk in the Montreal area, the Liberal Party of Canada took their talking points straight from an SNC-Lavalin press release. In the last few weeks, the engineering firm SNC-Lavalin has been the locus on which an Attorney General has lost her job and has told an eye-opening story indicating that the Prime Minister’s office looked to interfere with the Justice Department. Since that testimony to the Canadian public, which was broadcast live on February 27, 2019, the Trudeau Liberals have been using press materials straight from SNC-Lavalin to defend their own actions. With Trudeau leaning on the extra-judicial excuse that he only engaged in interference in order to save jobs, then we should be able to use what he knows of these jobs to figure out who gave him the information. Would you be shocked if I told you that he’s got his numbers all mixed up, and that Canadians have been quitting SNC-Lavalin en masse for years? SNC-Lavalin has provided employment figures to the public on their social media, press releases and through their year end annual reports. In 2013, SNC-Lavalin wished a Happy Canada Day to their 17,517 Canadian employees. The annual report from the end of that year suggests that they had 29,700 total employees down from 33,900 in 2012. In 2014, SNC-Lavalin reported 42,000 employees on their year end. Through 2015, SNC-Lavalin tweeted twice about their 40,000 employees. Annual reports suggest 36,754 employees. In January of that year, the company was charged by the RCMP in relation to bribery in Libya. In December 2016, SNC-Lavalin tweeted that they had “over 39,000 employees.” Marketing materials from earlier that year note “20,000 oil and gas experts.” Annual reports suggest 34,952 employees. By 2017, the number was 50,000 total employees with 5,500 being in America. In 2013, the number of US-based employees was 1,200. Annual reports suggest almost no change in the number of employees during 2017 and 2018, both years ending with approximately 52,400 employees. In 2014, SNC-Lavalin’s report mentions the acquisition of several hundred employees in Greater Montreal. In 2017, the company sold their head office building in Montreal and then entered into a 20 year lease for the building on René-Lévesque Boulevard West. SNC-Lavalin never intended to leave Montreal, even though that’s the excuse Justin Trudeau used to threaten JWR on September 17th, 2018. SNC CEO Neil Bruce said in a statement Thursday that SNC intends to maintain its head office in the Quebec City [of Montreal] “for the years to come“. As it stands, Jody Wilson-Raybould, former Attorney General, believes she was removed from her position of power because she would not go along with the demands of SNC-Lavalin’s CEO Neil Bruce and the office of the Prime Minister of Canada who wanted to clear the air on the firm. Trudeau told JWR that SNC-Lavalin would be holding a board meeting on September 20th, 2018 with their stockholders, and that one of the topics will be a proposed move to London, Ontario should their needs not be met by the Attorney General. By the way, mentioned Trudeau, my riding is in this city. During a September 19th, 2018, JWR met with the same Privy Clerk from before who again “brought up job losses,” and the upcoming stockholder’s meeting. On the same day, JWR spoke with Minister Bill Morneau who “stressed the need to save jobs.” Morneau is the MP for Toronto Center. Sheridan Park. SNC-Lavalin’s Toronto office is not located in his district, rather in Mississauga — still Liberal territory, of course. The office was completed in 2017 and provided space for 1200 employees. After winning the federal election in the fall of 2015, Trudeau’s Liberal Party appointed Jody Wilson-Raybould as their first Justice Minister taking over from Peter MacKay. CEO Neil Bruce took over in October 2015. …SNC-Lavalin [started] lobbying Justin Trudeau’s Prime Minister’s Office on the subject of “justice and law enforcement.” There were 18 interactions between PMO staff and SNC-Lavalin on the subject over the next three years, according to the federal lobbyist registry. In 2017, “the Trudeau government included the Criminal Code amendment [pushed for by SNC-Lavalin] creating the agreements in last spring’s 582-page omnibus budget bill”. In October of 2018, SNC-Lavalin published an open letter to Canadians stressing big projects they had designed and constructed in Quebec, Ontario, British Columbia and Alberta. In the letter, Neil Bruce mentions 52,000 total employees. The letter, posted October 10, 2018, states that since 2012’s “uncertainty,” 10,000 Canadian employees left and that at the time of writing they had only 9,000 Canadians on payroll. SNC-Lavalin had already lost 10,000 Canadian jobs, because Canadians quit because they didn’t want to work for a corrupt company! Kathleen Roussel, the Director of Public Prosecutions notificed SNC-Lavalin in September of 2018 that their request for a DPA — which would allow them to avoid the punishment of not being able to bid for government work — had been turned down. And here’s where things start picking up speed. 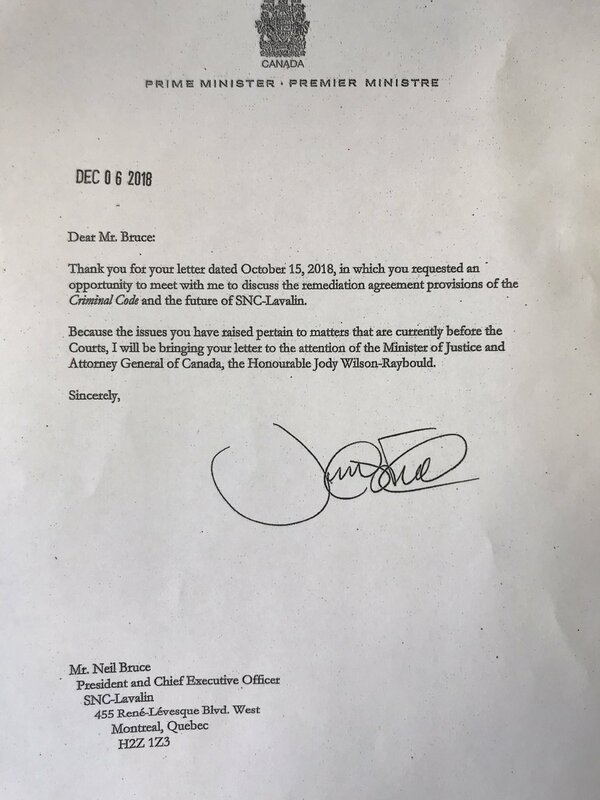 A letter sent by Neil Bruce looking to meet with Trudeau was dated October 15th, the same day a conversation took place between SNC-Lavalin chair Kevin Lynch (Clerk of the Privy Council 2006-2009) and Michael Wernick, the current Clerk of the Privy Council who was present during JWR’s initial meeting with Trudeau and then visited her again on September 19th. A few days later on October 19th, 2018, SNC-Lavalin submitted an application for a judicial review of Roussel’s decision. We have two letters letters dated December 6th, 2018, from the desk of Justin Trudeau. One to Neil Bruce stating that the matter is “before the courts” and that he would bring the letter to JWR. The second is the promised letter to JWR. Of course, the October 15th letter was in reference to a situation that was not “before the courts” at the time of its plea, as the application for a judicial review was submitted on October 19th. JWR, as the Attorney General, is empowered to override the decision submitted by Kathleen Rousell regarded the DPA. But, she would not bend, and she was informed on January 7, 2019, by Trudeau that she was being shuffled out of the AG position. When asked about her “demotion,” JWR said she did not consider working for Canadian veterans a demotion. Sticky language, that — not quite stating that she was demoted, moreso granting an honorable position to vets. Brison formally announced that he would not be standing in the 2019 election for the Liberal Party on January 10th and would vacate his seat by February 10th. The move was ostensibly to spend time with his family, but he was announced as the vice-chair of investment and corporate banking with the Bank of Montreal on February 14. Meanwhile, the Globe and Mail delivered their devastating piece on the whole scandal. JWR resigned her post as minister of Veterans Affairs on February 12th. Even more shocking, on Monday, February 18th, Gerald Butts stepped down as Trudeau’s principal secretary. JWR’s testimony took place on February 27th. In the House of Parliament that day, Justin Trudeau was questioned several times over the scandal and kept bringing up jobs, jobs, jobs, but no solid number of jobs. The Bloc Québécois mentioned “[sacrificing] 3,000 jobs in Quebec” the day before. O the same day that the BQ brought up their figure of 3,000 jobs — February 26th — the Liberal Party brought up the figure of 800,000. As in, Justin Trudeau’s government had created 800,000 jobs during his time as Prime Minister. Far be it for a layman such as myself to bring up Westray. But, back to the job numbers. And so on and so forth. What remains is that “9,000 jobs!” did not enter the Liberal lexicon until February 28th, and they’re using a different crib sheet than the BQ. Unfortunately, Hansard does not record whether anyone noticed that the reason nobody had brought up 3,600 workers in Quebec is because the Honourable Members cannot agree on the correct number. We know that SNC-Lavalin has 19 years left on a 20 year lease. We know that SNC-Lavalin has been bleeding Canadian employees due to their own shady past. And we know that SNC-Lavalin has approximately 9,000 Canadian employees, many of whom have the transferable skills to work elsewhere should the company disappear tomorrow. Since the interference with the Justice Department was given the face value of protecting jobs in Montreal by the Prime Minister — who has happily closed his eyes to ongoing job losses in the West — we can point to the ignorance of Trudeau’s Liberals on the real number of jobs at stake as further evidence that it’s all for show. On March 4th, Jane Philpott resigned her position as Treasury Board President, citing the SNC-Lavalin scandal. March 6th marks the testimony by Gerry Butts, which gave as little information to the Justice committee as would a person reading a newspaper at home would find accessible. Butts informed the committee that Trudeau had “assured Minister Philpott that the shuffle had nothing to do with the [SNC-Lavalin] file,” after Minister of Indigenous Jane Philpott expressed this concern to Trudeau in a one-on-one meeting to discuss moving her to the Treasury Board. According to Butts, this was the first time that he became aware of the bugaboo that SNC-Lavalin and JWR’s shuffle were in any way connected. Oh, and he mentioned the magic figure of 9,000 jobs. On March 7th, Trudeau implied that JWR was being pressured by his staff over SNC-Lavalin, and that she did not bring up the pressure and phone calls with Trudeau himself. Parliamentary debates have shown that the BQ are the ones who are fiercely protective of the jobs provided by SNC-Lavalin in Quebec. Trudeau’s Liberals only brought up job numbers after Jody Wilson-Raybould’s damning testimony, and then, they used the number of employees for all of Canada as a stand-in for the jobs Trudeau is looking to protect in his own riding by influencing legislation and the Justice Department to allow the company to evade their ten year ban on federal procurement contracts. Justin Trudeau’s Liberal Party of Canada is so backwards that they’re using the press releases produced by the same company that expensed hookers for Gaddafi’s son as the backbone of their excuses to Parliament and to the Canadian people. Shout-out to Bluetooth headsets. Here’s what I’ve been listening to the past few days. The Four Voices comprised Allan Chase (tenor), Sal Mayo (tenor), Bill McBride (baritone) and Frank Fosta (bass baritone) based out of Tennessee. The group formed in 1955 and faded into obscurity after the success of Sealed With A Kiss. You can hear them backing up a few Ray Conniff songs recorded between 1956 and 1958 such as the Fred Weismantel-penned Lovely One. Sealed with a Kiss was written by Peter Udell with music by Gary Geld. The two worked as Geld-Udell Music Corporation from 1959 and later went on to compose, write and win a 1975 Tony Award for their musical Shenandoah. The best known record of track is Bobby Vinton’s 1972 single, who arranged for the song to include a painfully 70s bongo lead-in. The disco edge ages the Vinton version, so I am happy to bring you the original and timeless variation.